I’m very used to making jams, jellies, chutneys, ketchups and pickles, all of which require basic sterilisation of jars, easy recipes and a straightforward process to fill and seal the jars. In these recipes boiling helps kill harmful bacteria and yeasts as well as reducing the moisture in which they thrive; sugar or acid stops regrowth and sealing in a sterilised airtight jar prevents recontamination. But these techniques aren’t suitable for low acid foods such as fish and meat which is why we often turn to other techniques to extend their shelf life. The same goes for vegetables, when we want to preserve them without introducing the strong acidic flavours of a pickle. Most commonly for fish and meat here in the UK, we freeze, cure or dry them. Freezing turns moisture into ice and also inhibits the growth of most bacteria. The advantage is that the fish or meat is as fresh once it’s been defrosted. Curing with salt, sugar, nitrates or nitrites works by drawing out moisture. It changes the nature and flavours of the fish or meat, but this is often highly desirable – many of us adore cured salmon, bacon and cured hams such as Parma and Serrano. Drying, by sun, in a dehydrator or oven, or by smoking, works on a similar basis of reducing moisture. It also seals the surface of the fish or meat, which makes it difficult for bacteria to enter. Smoked fish such as salmon and mackerel are popular in the UK. Biltong, Bresaola and jerky are examples from the dried meats category. I do know people who cure and smoke fish and meats at home. But it’s relatively rare. 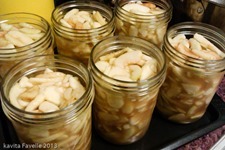 Preserving by fermentation is becoming more popular here too, though it is still uncommon. As the food ferments, it produces lactic or other acids, which are themselves preserving agents. Kimchi (which is enjoying a surge of popularity amongst foodies at the moment), sauerkraut and surströmming (which my dad enjoys but I just can’t get into) are all examples of preservation by fermentation. Of these three methods, freezing is probably the easiest for the home cook. Indeed, our freezer is full of raw home grown vegetables as well as raw meat and fish and portions of cooked food such as stews and curries. There is another way of preserving low acid foods so that they can be stored at ambient temperatures and retain their essential flavours or textures. Known as canning, the process was first trialled by the French navy in the early 1800s, after they launched a competition seeking new methods of preserving food. Although the method was originally tested and developed using jars, when the process took off commercially, most food was preserved in tin cans rather than glass and hence the process became known as canning. After the food is prepared and sealed in to the tin (or glass jar), a heat and pressure treatment is applied to the container to kill the bacteria within. It’s the heat, not the pressure, which destroys bacteria, but pressure provides the easiest method to achieve sufficiently high temperatures. It’s important to be thorough here, as there is no acid, sugar or salt added to the ingredients to restrict the growth of any bacteria that survives the treatment. Canning as a commercial process took off around the world, nowhere more quickly than in the US, as did its counterpart, home canning. Indeed, judging by online content, I consider America to be the spiritual centre of home canning! Many of the other preservation methods are more popular in Europe and elsewhere in the world, but it seems to me that the Americans have taken the canning process to heart. It’s critical to reach the correct temperature and to maintain it for a sufficient duration, which can be quite a challenge for the home cook. To that end, there are home pressure canners available, though in the UK we have access to a smaller selection, at higher prices. 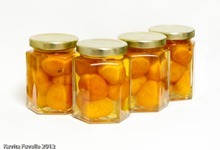 Because of the risk of botulism, the toxins of which are not detectable by taste or smell, the United States Department of Agriculture (USDA) provides detailed guidelines for home canning. Botulinum spores are very hard to destroy at 100°C but can be eliminated at 120°C, provided the temperature is maintained for long enough. Where foods do contain enough acid, the guidelines suggest a boiling water bath will be sufficient. For lower acid foods, a pressure canner to reach the higher temperatures is recommended. 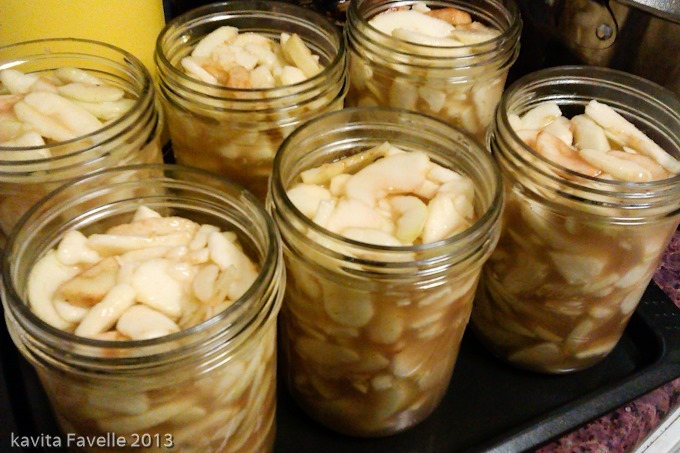 As an avid food blog reader, I’ve been bookmarking home canning recipes for several years. Attending an event by Le Parfait, when they launched their products into the UK last year, gave me the last push to give this form of preserving a go myself, especially when they kindly provided some sample jars for me to use. In the US, Ball or Kerr brand Mason jars are the most popular, featuring a two part lid – a flat disc cap that seals to the rim of the jar and a screw on band which secures the disc cap into place until the canning treatment creates a vacuum seal. Here in the UK, we’ve traditionally used hinged clip top jars with rubber sealing rings such as those made by Kilner. Indeed, like Hoover vacuum cleaners, “kilner” seems to have become shorthand for describing this style of jar regardless of manufacturer. Le Parfait is a French brand and has been going for over 80 years. They offer both styles of jar – their Super Preserve and Super Terrine both have clip top lids and their Familia Wiss have seal caps under screw-on lids. As far as I can see, the advantage of the clip top design is that, once purchased, the costs are minimal. The rubber sealing ring lasts well, though not indefinitely, and needs replacing from time to time. That said, I find them more difficult to open and close, and awkward to sterilise, since I use the oven method for jars and boil the lids separately. The Mason style jars are much easier to use but since the disc caps are single use only, the costs of using them are higher. At the moment, I don’t have a pressure cooker or pressure canner, so I’m using a large and ancient Indian aluminium stockpot. I mentally refer to it as a cauldron, though that does give a slightly wiccan air to it. I also don’t have a canning rack – essentially a special wire metal basket and handle which makes lowering and lifting jars from the water much simpler; it also keeps the jars from sitting directly on the base of the pan, touching the sides or rattling against each other. In my cauldron, I use several flannels and tea towels to line the pan and separate my jars and I’ve not yet discovered an easy way of lowering the jars into boiling water! Without pressure, I can’t achieve temperatures above 100°C, so am hesitant to use the technique for fish or meat products. Stay tuned for my first canning experiments. 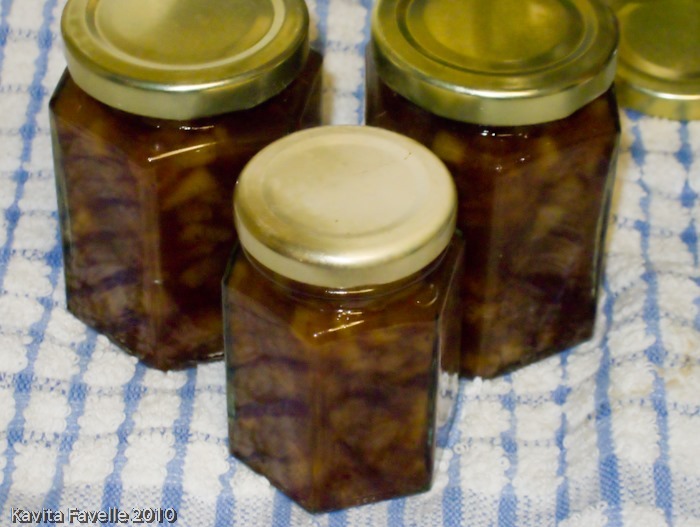 13 Comments to "About Home Canning & Other Preservation Methods"
Bottling in the UK, more or less died out after WW2 and only diehard allotmenteers seemed to have kept the craft alive, as a way of making the most of their produce. You often read about how to bottle and it always has an air of makeshift about it; for example using folded dishcloths or newspaper on the base of your pan. This works perfectly well of course, but I find it a complete pain, as the cloth/paper begins to float when no jars are helping to keep it in place, and it is easy for the level to become bunched up so your jars are more liable to tip over rather than sit steady in the water bath. A trivet from a pressure cooker does the job much better and is geared up for the job. Depending on the diameter of your water bath, it might be hard to find one wide enough. I bought mine on ebay from the US and it wasn’t very expensive as it weighed light. Also you can buy jar lifters (Kilner make them amongst other brands) that make it easier to lift jars in and out of the water bath without scalding your fingers. Being properly equipped makes the whole job really easy. Good luck and look forward to hearing more of your canning adventures. I’ve just won a pressure cooker in a blog competition on another blog, so shall see how I get on with that. I’ll also be heading to the US soon so will see what I can buy there. Interesting that you remember the clip top lids as being traditional in the UK. I didn’t even know they existed until I had left home, we only ever used Kilner jars with flat metal lids and screw tops. My mum was an avid canner (we just called it “putting up”) and my dad had an allotment that fed her with fruit and veg. We also had a massive chest freezer, so a lot of fruit and veg went in there, but my mum was a traditionalist so apples and plums and blackberries would be canned for pies in the winter. 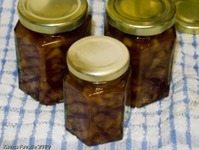 I have some plums that I put up in traditional kilner jars a couple of years ago, that still seem in good condition. I processed them in the oven rather than in a water bath. I have looked through a few older cookery books, but even those don’t reference canning (with the heat treatment). Wonder why it’s mostly died out? Maybe the type of jars is just an age/ exposure thing…? I feel a lot more confident about trying to jar my chutneys after reading your blog! Had Gina directing me to this blog! I love the Le Parfait jars….I think I am going to use experimental them for my first batch of experimental chutneys! Typically the sauces contain veg (canned and fresh), dried herbs, dried spices, olive oil and butter. Without specialist equipment can I safely preserve them for camping? People keep saying sauces but I don’t know if they mean savoury cooking sauces. Did any of your canning work? As I don’t have the equipment to pressure can, I’ve not returned to canning fish or meat myself. I’ve canned fruits and vegetables successfully. I remember reading this when you first published it – very informative. I always think canning has taken off in America where people live in more remote locations and it’s a good way to preserve food long term in a manner that leaves it closer to its original state. They’re also more likely to have the space to hoard all the jars. I like the idea of doing this myself but along with pickles and jams I tend to be awash with enough of it in the storecupboard I never get around to bothering. Yes, having more space available is definitely a boon as my small under-the-stairs larder space (which is more than many have) is already full of preserves! I think it’s also fair to say that the American food safety guidelines err on the side of ohmygodyouregoingtodie over cautiousness which means that anyone following the guidelines will can (i.e. heat treat) their preserves rather than relying on sugar and vinegar to preserve. Really happy you found the post informative.